“Wild Pacific Rim trails are great! All are well constructed with helpful interpretive signs. Paths require some uphill trekking and just take your time--all is doable!!!" 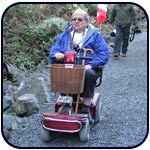 This trail section is accessible to children’s strollers, and paved wheelchair access is available at the lighthouse, and beyond if you have an off-road model. 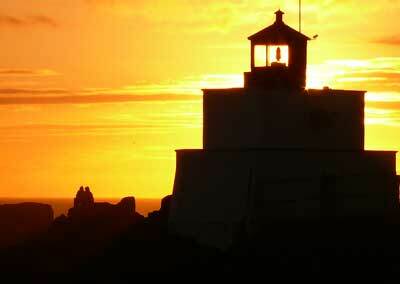 Your exploration starts at the tip of the Ucluelet Peninsula. Park at the first lot on Coast Guard Road. A smaller lot is available at He-Tin-Kis Park, which is the trailhead for Terrace Beach Interpretive Trail. If you have a wheelchair there is a paved access from the Coast Guard Station parking lot (please use the first lot on Coast Guard Road if you can walk). Please leave bikes in racks provided at parking lots. Portable toilets are provided at the three entrances to the Lighthouse Loop (the main lot, lighthouse and He-Tin-Kis Park). The trail is open year-round during daylight hours. Easy grade along the coast, hills inland. No stairs on the main route. The new Bog Interpretive Loop or two small beaches are be an enjoyable extension to the loop. Allow extra time to enjoy views from frequent benches. This wilderness trail starts at a gravel parking lot midway on Coast Guard Road. To see the lighthouse first, walk clockwise to your right from the 0 km marker through a mossy rainforest which	leads to the famously rugged and wind-swept coastline. The trail traces the edge of rocky headlands past dramatic views of	Barkley Sound and Amphitrite Lighthouse. Enjoy viewpoints	for great vistas, but stay on the trail. The rocks are not safe. Originally built in 1906 in response to the shipwreck of the Pass of Melfort, it was replaced in 1915 with the current building to better withstand hurricane force storms. Enjoy this iconic sentinel keeping watch over Barkley Sound and the archipelago of the Broken Group Islands. Watch boats and seabirds which change with every season. Over 300 species migrate through the Ucluelet Peninsula. Inspiration Point and He-Tin-Kis Beach offer fantastic views via stairs cut artistically into the headland. When you reach a fork in the trail near km 2 you can stay to the right to stay on the Lighthouse Loop or turn left to visit Terrace Beach Interpretive Trail at the site of an ancient First Nations’ canoe beach. Interpretive signs identify native uses of plants and share a rich history dating back 5,000+ years. Click here to see a live web cam. Come early for the misty sunrise or catch the sunset over the open ocean - a great finish to any day. Photographers love the silhouette of trees leaning into the setting sun from a series of viewpoints to the north of the lighthouse. "Please STAY ON THE TRAIL and learn from my experience", says Oyster Jim " venturing on the rocks can be deadly". 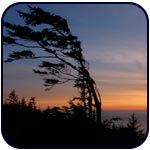 In the event of extreme winds, the trail will be closed due to danger from falling trees.